Photo Credit: @palegirlrambling on Instagram. We absolutely love the holidays at the Kladder House and if it weren't for Jeff putting a firm rule in place about no Christmas decor before Thanksgiving, our tree would already be up. However, despite his pre-Thanksgiving Grinch-like demeanor, I cannot be stopped from busily working behind the scenes on our Christmas cards! This year we teamed up with a new partner, Basic Invite, to create one of my favorite bundle of Christmas cards to date! The process begin in early October after we scheduled our mini photo session with our favorite photographer James Richard Fry: $150 for a 25 minute session and full rights to a gallery of 15-20 edited photos. Done and done! Within days of the shoot James emailed us our proofs and off to Basic Invite design land I went! With over 250 holiday design options and nearly unlimited color choices, you are pretty much guaranteed to customize your cards this year. Full disclosure, we ordered our photo cards from Costco last year and ended up having the exact same card as two other families in our network of friends. Don't get me wrong, everyone survived this occurrence, however, who wants to be the same! 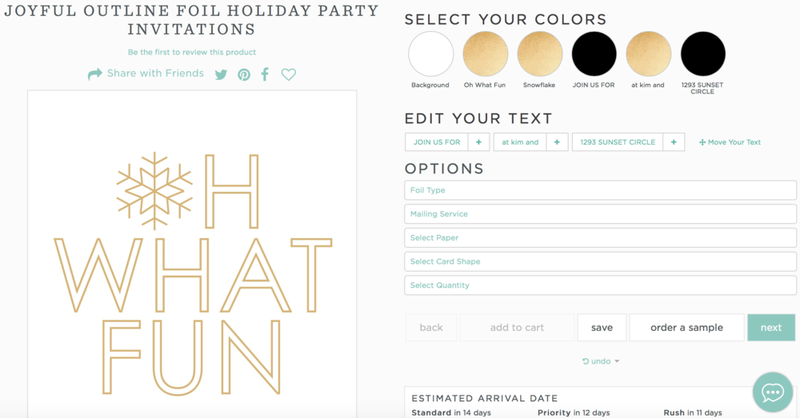 Basic Invite allows customers almost unlimited color options with instant previews online. The design tool is easy to use and actually kind of fun to tinker around with. Once you select a design you can change the color of each element on the card to over 180 different color options so you can make sure the card is exactly how you want it down to the littlest detail. And if you're worried at all about what the final product will look like before final purchase, Basic Invite is one of the very few websites that allows customers the ability to order a printed sample of their card before placing your final order. I also found the envelopes just as fun to sift through as I did creating the card design. Envelopes come in over 40 different colors so you can make your delivery stand out from the rest! Lets be serious though, I picked white. Call me consistent, call me predictable. I like what I like. And bonus... all envelopes are peel and seal which means no licking! Save that saliva for something with calories in it. Basic Invite also offers an address capturing service. I didn't personally use this part of the process simply because I enjoy handwriting the addresses on each card, however, the tool seems pretty nifty and if you're into automatic labeling, this would be your jam. You can upload all the addresses to their site and your envelopes will come already addressed, at no extra cost. After ordering our cards they arrived within 7 days of purchase and with this midwest gloomy/wet weather we've been experiencing lately it's likely the Kladder Christmas card will be the first to arrive at your house this season. Apparently, it's a personal goal of mine to plaster our family's faces on all of our friends and families refrigerator doors for as many weeks as possible! That is, until we're tossed out with the old cookies and uneaten candy canes at the end of the year. And if you're a procrastinator, no worries, you can pay a little extra to rush print your order. Boom. Feeling behind on getting your photo Christmas cards or holiday party invites out this year? Don't, I'm weird and do things incredibly early. You've still got plenty of time and Basic Invite is now offering 30% off with coupon code: holi30. Happy creating!